Named after Shen Kuo, discoverer of the magnetic north. If you have ridden a Kuo+ before, then this bike just lifted the bar higher and makes for an even better ride. The motor has more pull now that it is 350 watts. The battery capacity is up 35% so you can go further than before. Yes it is quicker than the Kuo+, so we beefed up the brakes to stop it faster too. The bike is also now set up with dual assistance inputs, you can use the pedal assist and throttle. Finally the display was also ugraded for better peformance and a smaller unit. The Kuo Boost has all the practical folding capabilites of the Kuo+ before it, so you can take it on transport or get it in the boot of your car. To make the ride even better suspension has been added and the tyres upgraded so it just handles better. All the practical things you loved on the Kuo+, like the mudguards and lights have also been upgraded. The Kuo Boost is even more practical to use in so many situations, and even more fun to ride. How fast and how far can the Kuo Boost go? 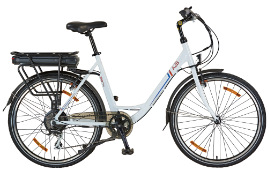 The Kuo Boost can reach speed of up to 20mph (32 km/h) worldwide an in Europe 15.5 mph (25 km/h) however you can pedal faster. The Kuo Boost will assist you up to 45 miles (72 kms) (the distance varies depending on the weight of the rider and riding conditions). How does the Kuo Boost handle hills? Despite the small size of the Kuo Boost it has more power than our other full sized bikes. With the correct selection of gear you will find that the Kuo Boost will take on the hills without hassle. A ‘state-of-charge’ battery icon on the display highlights the level of charge. There is also a percent number showing an estimate of the charge remaining. The indicator works like a fuel gauge on your car and will let you know when you are running low and should re-charge. Can I buy accessories for the Kuo Boost? The Kuo Boost has an optional carry bag available designed to pack away your folded bike for either storing or transporting when dirty or muddy, ideal for the boot of the car. 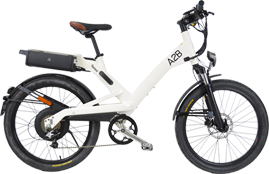 We have a range of accessories to meet your lifestyle needs available at your local A2B dealer. Visit the accessories page to view the range. The Kuo Boost has 5 levels of assistance to allow you to control the power. A full range of gears also allow you to set your cadence to the conditions or your preference. How do I charge the Kuo Boost? To recharge the battery simply plug the charger into any standard outlet and connect it to your portable battery (either on the bike or off the bike inside). To complete a full charge may take up to six hours depending on how discharged the battery is at the beginning of the charging process. Usually it should be around 4 hours. For the best performance we recommend to charge your Kuo Boost battery at least every two months and if you are using it frequently try to use as much of the capacity before charging. The battery should be charged in temperatures greater than 10 degrees and not above 35 degrees.